At more than 70 years of age, Massey University’s latest Maori PhD recipient is a role model for aspiring, young students – not only as a successful scholar but also as someone who is still seeking to understand his place in a bicultural country. 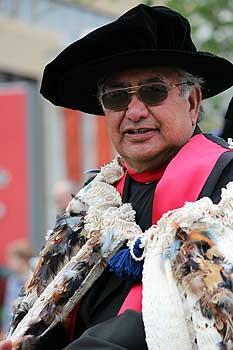 The Venerable Te Waaka Melbourne, Archdeacon of Waiwhakaari and an Enabler in the Hui Amorangi (Diocese) of Manwa-o-te-wheke, will add Dr to his title following the conferment of his Doctorate of Philosophy on Friday. Mr Melbourne, of Tuhoe, looked at the role of Maori spirituality and the marae and its relationship with western religion, specifically the Anglican church, drawing on his whakapapa and his role in the Anglican ministry, which he joined as a young man in the 1950s. Specifically, the thesis examines Māori spirituality reflected in the simplicity, cultural and intellectual rights of the words Te Wairua Kōmingomingo o te Maori. It argues that while Christianity has taken a strong hold on Māori spirituality, “primal belief is very much alive in the ordinary life of the Māori”. Mr Melbourne says he chose his thesis topic because he was trying to understand his personal state of ambivalence about his own culture, which combines Maori with an English upbringing – a confusion being reflected and amplified across the country amongst young people who do not have a connection to a marae. “What is happening on the marae is not what is happening in the suburbs and the modern world. A lot of people can move between the two but there are a lot of young people who have not had the opportunity to understand what it is to be ‘Maori’. Those who have lost access to their marae are suffering a loss of whakapapa and loss of culture,” he says. His supervisor, Taiarahia Black, Professor of Maori Studies at Massey says Dr Melbourne is a role model for Tūhoe, for Māori, for young and not so young. “He stands out for me because of his commitment. He’s in his 70s but he really is courageous and did not give up,” he says. “He faced many challenges while writing his thesis – but he vowed that he would complete his doctorate. He has fulfilled the potential that was identified by his kaumatua many years before. That is the sort of commitment that we would like to see in our young people – if he can do it, then so can those much younger, ” says Professor Black. Mr Melbourne says his message to young people is not to give up. “You must pursue what you believe but be ready to change your mind. Believe in what you believe to be right for you and the people around you. The thesis begins by looking at the culture and the theology of the small, predominately Māori-speaking community of Ruātoki, from the viewpoint of farmer George Melbourne (Te Waaka’s grandfather) alongside the prophet Rua Kēnana - who together, with their understanding of Te Wairua Kōmingomingo developed the City of God in Maungapōhatu in the early 1900s. From this basis, it moves to the modern day to query whether there is an evolutionary or revolutionary quality in the 1992 Constitution of the Anglican Church in Aotearoa New Zealand and Polynesia. It finds that while “there is no doubt the 1992 Constitution is revolutionary as it provides three separate tikanga - Maori, Pakeha and Polynesian – to carry out its mission statement through their own distinctive cultural practices, it is also evolutionary in that it continues to evolve to meet the changes of Te Wairua Komingomingo”. International Examiner, Dr Tina Ngaroimata Fraser, of Tuhoe descent and now Assistant Professor/School of Education/School of Nursing & First Nations Studies at the University of Northern British Columbia, said she found the thesis captivating. “This dissertation is inspirational, illuminating and evocative. “It is the first doctoral thesis that I have ever been immersed in that captured me spiritually, mentally, emotionally and physically to the point where I was drawn not only to the mist, but into the thesis for over sixteen hours straight. I had a difficult time coming out of a world that touched my every sense of knowing and being Tūhoe/Māori. Professor Black was Mr Melbourne’s supervisor for his Masters Study and now doctorate thesis. “I think the key to our enduring supervisory partnership was the openness to building the transition discussion base, the structure, methodological framework and direction with the ability and scope by Te Waaka to apply the Māori spirituality essence. Te Waaka Melbourne, Tūhoe, hails from Te Urewera-Ruātoki. As a young man, Te Waaka was identified by the kaumātua of Tūhoe to enter the ministry of the Anglican Church, rising through the church to achieve the role of Archdeacon of Waiwhakaari (Mataatua) and has the distinction of holding the title Kai Whakamana (Enabler) for the Mataatua, Te Arawa and Waikato Tribes which is the training of all Maori Anglican Priests in Te Hui Amorangi (Diocese) of Te Manawa-o-te-wheke area. Professor Black says Dr Melbourne comes from a very talented whānau and his extended whānau are well known in teaching, Māori academia, nursing, the Māori film industry and supporting protocols and etiquette on marae in Tūhoe. His son Taiarahia is a teacher who graduated from Massey with his Masters degree in Education, while his children are in the Armed Forces, teaching, supporting Māori politicians - all in some form supporting Māori development on education fronts. His younger brother Hirini Melbourne a prolific, brilliant traditional and contemporary song composer was also at the fore font of the renaissance to restate and reinvigorate the art of tradition Māori instruments, receiving an Honorary Doctorate from Waikato University in 2003.